More than just a cookbook, Grace Young's Breath of a Wok covers the history, culture and lore of the traditional Chinese cooking tool and shows us how to use it.  Souvlaki One of my favorite Greek dishes is souvlaki, grilled lamb on a stick. It's easy to make at home, and you don't even need the stick.  Book Review: Breath of a Wok Wok Hay, the elusive scent that signals stir-frying done well: This fine book tells how to achieve it, and why you should want to. A few years ago when we lived in Astoria, a Greek-American neighborhood of New York City, I stored up a plate full of delicious Greek food memories that ranged from egg-lemon soup to roast chicken to sweet, rich baklava dripping with honey and thick, strong Greek coffee with the grounds right in the cup. One of the most enduring of those food memories was neither sit-down restaurant nor coffee-house fare, but a decidedly modest street-food item: Souvlaki, a wonderful walk-around treat sold by street-corner vendors. It's really nothing more than cubes of lamb stuck on a skewer, grilled over charcoal and very simply seasoned with garlic, oregano and lemon, yet another demonstration of the perfection of simplicity. Just about every commercial corner in Astoria had at least one souvlaki man, but I swear ours was the best, holding station almost year-round with his cart, grill and umbrella just down the stairs from the Ditmars Boulevard subway station at 23rd Avenue and 31st Street. His souvlaki was always crisp on the outside, tender within, distinctly lamb-flavored but never unacceptably gamey. Even the smoke that drifted from his grill smelled so good that it would draw you in from blocks around. I'd often pick up a couple of sizzling sticks to carry home, an easy dinner that could be pulled right off the skewer and served, still hot, with rice or bread and a salad. Now we're back in Louisville, which has plenty to recommend it in the culinary department, but sadly the nearest souvlaki man is about 700 miles away. But that doesn't mean I can't make my own! All it takes is a few simple ingredients, none rare or exotic; and you don't even have to use lamb, as beef, pork or even chicken or turkey will make acceptable substitutes. It's also okay to roast the meat in the oven or saute it in a skillet on the stovetop. I say lamb is best, though, and grilling it over charcoal is best; and if I make souvlaki at all, that's how I'm going to do it. It's not that complicated a process to cut your lamb into cubes, stick them on skewers and grill them, but it's even easier to grill a one-piece slab of lamb, which leaves open the option of cutting it into cubes, slices or steaks depending on how you want to serve it. 1. You'll save time and effort if you can buy a one-pound chunk of boneless lamb leg, but if you have to cut it up yourself, try to cut out a piece that you can butterfly (slice almost through the middle and open like a book) so as to end up with a fairly even rectangular piece of meat about 10 inches long by 3 inches wide and 1 inch thick, with a little fat left on one side. It's not at all important that it be exactly even; variations in thickness, nooks and crannies simply allow for a few nice charred bits to add texture to the rare meat. 3. While you wait, build a hot charcoal fire in your grill, being patient while you wait for all the coals to be covered with gray ash. I like plain chunk charcoal in preference to briquettes, but use what you've got. Set up the grill for direct and indirect cooking, with part of the grill directly over coals and part of it over clear space where you can move the meat to let it cook without direct exposure to the fire. 4. When the coals are ready, put the lamb on the grill, fat side down, directly over the fire. Let it cook for just a minute or two; it will sear quickly, but you don't want it to burn. Turn over the lamb and let it cook on the other side for one minute; turn it again and rotate it 90 degrees so as to get criss-crossed grill marks. One more minute, then turn again for a final minute on the other side. Now, move the lamb, fat side up, to a spot on the grill where it's not directly over the coals but close enough to stay hot. Close the grill lid and let it cook on indirect heat, turning it after about 10 minutes; after 10 more minutes, check for doneness by touch, cutting a small slit in the meat to see if it's hot-pink inside, or with a meat thermometer, looking for a temperature around 145F. 5. When the lamb is cooked as you like it (and please try it medium, hot-pink rare), remove it to a hot plate. Sprinkle with the dried oregano, a little more salt and pepper, and the juice of the lemon. You can serve it whole and carve it into thick slices at the table or, if you prefer a more souvlaki-like treatment, cut it into cubes before seasoning, put the cubes in a hot bowl with their juices and then toss in the oregano, salt, pepper and lemon. Either way, serve it while it's sizzling hot. MATCHING WINE: The simplicity of this dish opens the option of just about any dry red wine that pairs well with red meat, from Bordeaux to Burgundy to the Rhone Valley and Northern Italian reds and their New World equivalents. It was great with the Domaine Grand Veneur 2005 "Les Champauvins" Cotes-du-Rhone Villages featured in yesterday's 30 Second Wine Advisor. Wok Hay, the "energy," the "spirit" or, literally, the "breath" of a wok, is the Cantonese term for that elusive scent that signals stir-frying done well. "My fascination with the wok began at an early age," author Grace Young writes in the introduction to The Breath of a Wok. "From the time I was a child, I was taught to respect wok hay - the prized, elusive seared taste that comes only from stir-frying in a wok." Recalling dinners with her father, Baba, in San Francisco's Chinatown, she tells how he would stroll into the kitchen to discuss the evening's dinner with the chef. "A reserved man, he rarely displayed his emotions, but those visits to the kitchen always charged him with an infectious excitement. 'I asked the chef to give us extra wok hay tonight,' he would tell us." This gentle, beautifully told and illustrated book communicates an infections excitement of its own. It makes me want to get out my wok and cook something Chinese right now. The first night it arrived, I rushed it to the kitchen, and following its simple instructions (in short, don't be afraid to fire your wok much hotter than you ever thought reasonable), fashioned a simple old favorite (Sichuan shredded beef) with more wok hay than I had ever achieved before. Note well that this isn't primarily a cookbook, although it does contain perhaps 150 good recipes in its 240 lavishly illustrated large-format pages. More than just a cookbook, though, it covers the history, culture and lore of the traditional Chinese cooking tool and shows us how to use it. Highly recommended ... and your purchase will help support WineLoversPage.com and our E-mail publications. 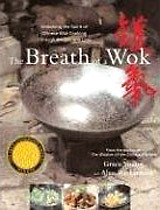 You can order Grace Young's "The Breath of a Wok" from Amazon.com in hardcover for $23.10, a 34 percent discount from the $35 list price. Again, purchases made using this direct link will return a small commission to us at WineLoversPage.com and help make it possible for us to provide our online information and communities and distribute The 30 Second Wine Advisor FoodLetter and other E-mail publications without charge.